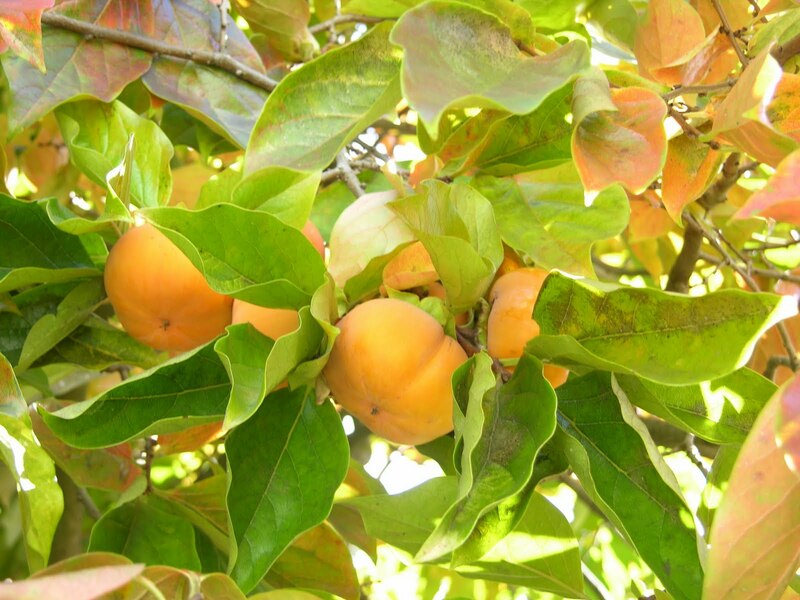 So we have this persimmon tree in our back yard that's been full of fruit for a while now, just like it was last year around the same time. And just like last year, I found myself staring down this tree with its copious amounts of orange fruit and having no idea what to do with it. So of course, the birds and squirrels had quite a fall feast because eventually my attention turned to other things. As an East Coaster, I don't have much experience with persimmons, but this year I was determined not to let them go to waste. 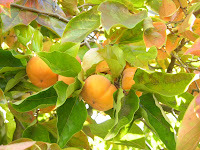 After a little research I discovered a few things: our tree produces the Fuyu variety of persimmons; the fruit is fairly popular for baking; and if I really wanted to figure out what to do with them, I should just try eating one first. I don't know why that last bit didn't occur to me sooner (and I must admit I had a little help figuring it out). My co-worker was snacking on a persimmon at work that she had picked up at the grocery store. I stood aghast: "Is that...a persimmon?" I asked in my most incredulous voice. Indeed it was. Neatly peeled and cut into wedges. She offered me a piece and I accepted--it was crisp like an apple, but less sweet, and had an aftertaste of chestnuts. Overall, it was pleasant on its own. Who knew? The next day I brought a bag of them to work for my friend, who could not believe I had a whole tree of these sitting around in the yard and that I didn't know what to do with them. Apparently just eating them right off of the tree is a good place to start. But even with this revelation, there was still the issue of what to do with the rest of them--at least 4 pounds still remained on the tree. So I needed a project to take care of the stragglers, before the squirrels made off with them again. In the end, after much (online) rifling through recipes, I decided on a chutney. 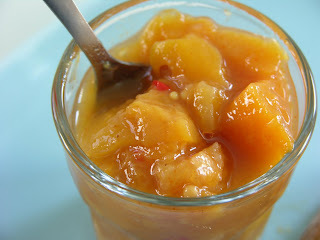 We've been out of our staple mango chutney for some time, and I thought this might make a great substitute. I found a recipe from Sunset magazine from sometime in the 1980's, and made a few changes....most notably, the absence of those vile dried fruits: raisins. I ended up with a decent batch, just enough to store a few jars in the pantry and share a few with friends. 1. 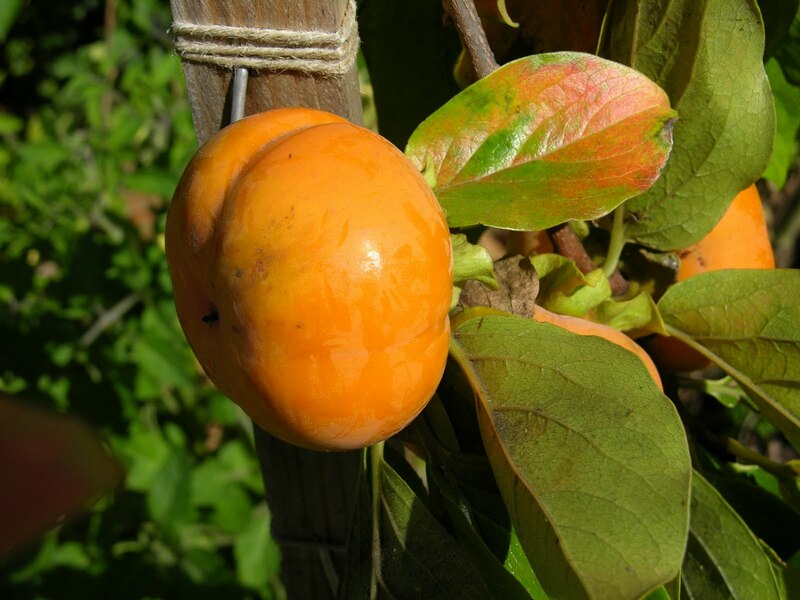 Prep the persimmons by peeling them with a vegetable peeler and then chopping the fruit into small pieces or chunks. Remove seeds if you find any. You'll probably end up with about 6 cups of fruit. 2. In a non-reactive pot (big enough to hold at least 6 quarts), add ingredients water through chili powder. Bring contents to a boil and reduce heat to let the mixture simmer. Cover the pot and cook about 15 minutes. 3. Add vinegar and sugar, stirring well. Then allow the mixture to simmer for about an hour, or until the mixture reaches the desired thickness. The chutney can be served immediately. Addition of salt is optional. *I ran out of white vinegar and used half apple cider vinegar to make up for it. I like the results and would probably make the same substitution again. I don't have an actual canner, so I use a large pot (12 quarts) with a cooling rack (like you'd use for baking) on the bottom to keep the jars from resting on the pot. 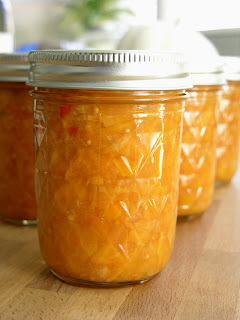 -So bring a large pot of water to simmer, then add your empty jars and let them sanitize for a few minutes. Keep them in the hot water for as long as possible. I usually just pull them out of the water one by one as I fill them up. Meanwhile place the lids (not including bands) in smaller pot of hot water, also pulling those out as needed. It helps to have a magnetic "lid lifter" to keep from burning your hands. -Fill each jar with the chutney, leaving about 1 cm of space at the top. Use a spoon or other utensil to make sure there are no pockets of air inside the jar. you'll just need to move it around in there a little to let everything settle. Make sure the lip of the jar is clean, then place the lid on and tighten the band. I typically wait until all of my jars are filled to start returning them to the pot. -Once all jars are filled and back in your canner, turn up the heat and bring the water to a rolling boil. This is easiest with the lid on. The water in the pot should cover the jars by at least a few inches. Once the water reaches a full boil, start timing. You'll want to process this for about 15 minutes, keeping the water at a hard boil the entire time. 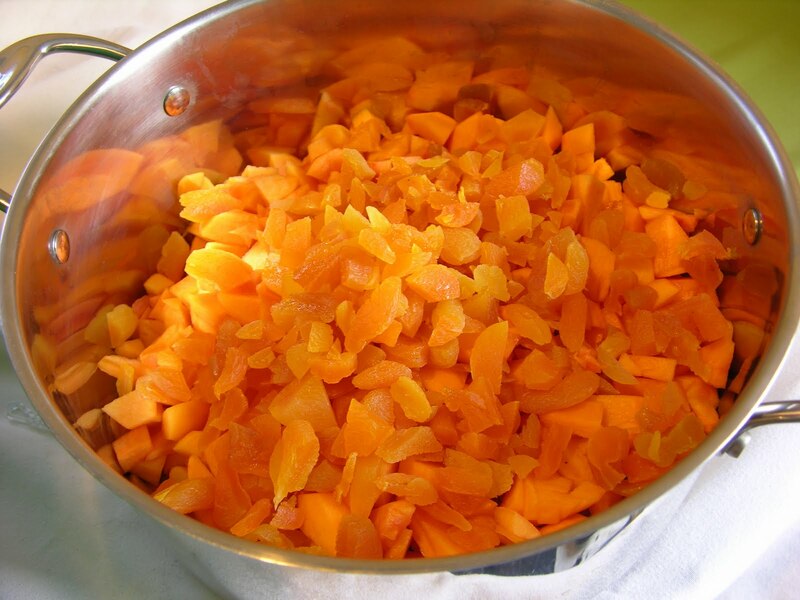 -After you've finished processing, take the lid off of the pot and let the jars sit in the hot water for 5-10 minutes. Then remove the jars and set them out at room temperature (the canning books recommend a place free from drafts, so I covered mine with a dish towel). Let them stand for about 24 hours to let the contents settle and the seals set. You'll hear some little popping noises as the jar lids cool. When opening the jar later, the lid (not the band) should give a considerable amount of resistance. If it doesn't, don't eat it. I recommend the Ball Canning Set--comes in handy for canning and has everything you need to keep from burning yourself. Get it here or anywhere that sells canning supplies. Also for more extensive canning instructions and other chutney ideas, try the Complete Book of Home Preserving, also by Ball. Of course I find out my neighbours have a persimmon tree AFTER I move! I was thrilled to find this recipe. I had already peeled fuyu persimmons and had no idea what to do with them. I did apple juice instead of water, used apple cider vinegar and cut all sugar. It tastes great and is currently in the water bath. Thanks! Glad you found the recipe helpful. Good idea subbing in apple juice and not adding sugar! I am SO glad you posted this recipe, like many other people I had a loaded persimmon tree this fall & no idea what to do with them all. I did alter your recipe a bit (I am constitutionally incapable of leaving a recipe alone), used some pretty zippy green jalapeños & more of them, heavier on the cots, all cider vinegar & oh horrors, a pound of golden raisins since I happen to like the things! & it turned out great. My only disappointment was with the full water bath, got a good solid seal on all the jars but never got to hear my favorite canning sound, the 'plink' of jar lids being sucked in by the vacuum as they cool. A minor point. Thanks again!